Asking prices of private non-landed residential properties inched up 1.4% QoQ. Private property supply surged 58.7% QoQ in Q3 as several mega projects with more than 1000 units were launched in the last three months, according to the latest PropertyGuru property index data. Excluding executive condominiums (ECs), total sales for new and resale units fell 20% QoQ to 5,600 units from 7,000 in Q2 due to the drop in the number of resale transactions, the report found. Urban Redevelopment Authority (URA) data showed that resale transactions accounted for 46.3% of all sale transactions in Q3 compared with 65.4% in Q2. “Many individual sellers may have chosen to delay putting their properties up for sale and assess current market conditions first following the recent round of property cooling measures in July 2018,” PropertyGuru said in its report. Amidst the cooling measures which will likely reduce home buying demand, developers still continued to launch new projects given that several showflats maintained healthy sales records. The report pointed to how residential development Jadescape which was launched in September sold 300 of its initial 480 units released in Phase 1 at an average price of $1,700 psf. Similarly, MCL Land’s Parc Esta in Eunos which was the last major project launched in 2018 sold 329 units at an average price of $1,680 psf during the development’s weekend launch in November. “Next year, the property supply will increase as there were $10.5b en bloc deals concluded in H1 2018 and many of these sales are expected to be launched for sale in the coming months,” PropertyGuru highlighted. These developments will include Pearlbank Apartments in Outram which was sold to CapitaLand for $728m and Parkway Mansion in River Valley that sold for $938m to a GuocoLand-led consortium. In terms of pricing, data showed that prices of private non-landed residential properties in Singapore inched up 1.4% QoQ and 9.4% YoY. Albeit at a slower pace, asking prices for private condominiums continue to rise following the latest round of cooling measures which saw an increase in Additional Buyer’s Stamp Duty (ABSD) and the tightening of mortgage rates. PropertyGuru’s report highlighted how foreign buyer sentiment dampened as instead of paying an ABSD rate of 15% previously, this has now increased to 20%. At the same time, property developers who are hoping for Chinese buyers to continue purchasing luxury homes in Singapore will also have to contend with China’s tightening controls on outbound investment. 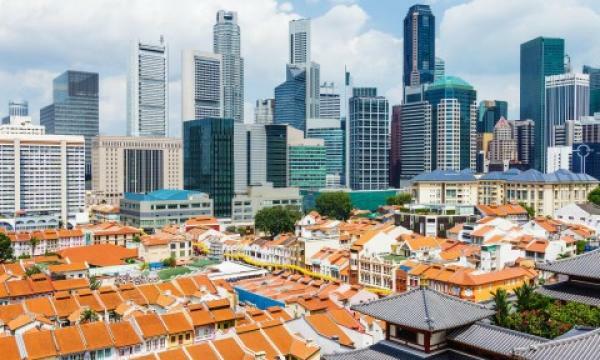 According to the report, the core central region (CCR) was the only area to record a price increase of 1.3% for non-landed properties in Q3, according to URA data. In the rest of central region (RCR) and outside central region (OCR), prices fell 1.3% and 0.1%, respectively. “Interestingly, the PropertyGuru price index revealed that city fringe districts 12, 13 and 1 reported the highest QoQ increase in prices by 12.6% which could be attributed to the launch of several mid-market condos such as Park Colonial next to Woodleigh MRT station and the Tre Ver in Potong Pansir,” PropertyGuru added. For District 15, there is still strong demand for properties, whilst the developing District 19 which encompasses Punggol, Sengkang and Serangoon is expected to see keen interest from buyers with several new projects such as Affinity at Serangoon and Riverfront Residences launching in recent months. Meanwhile, private residential property rentals across Singapore have been following a slow upward trend since Q1. According to URA data, rentals rose 0.3% in Q3 following a 1% increase in Q2. “The overall recovery in the rental market is due in part to the improved vacancy rate which decline to 6.8% in Q3 compared to 7.1% in Q2,” PropertyGuru explained. Rental prices of non-landed properties in RCR rose 1.5%, followed by OCR which saw rentals increase 0.9%. However, rentals of similar properties in CCR slipped -0.9% in Q3 compared to the 0.8% increase in Q2. Despite this, more than 10,000 units are expected to be completed in 2019 which will offer more housing choices to renters, the report highlighted, with properties that in close proximity to public transportation, shopping amenities and schools continuing to attract tenants.